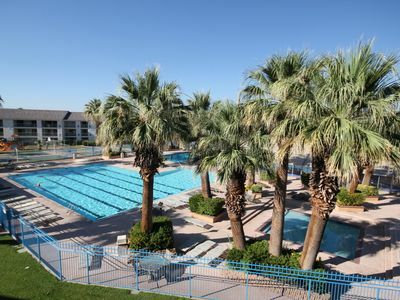 Our condos are located in Sports Village, in the prestigious Green Valley corner of St. George. 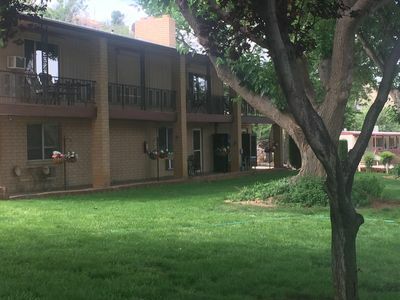 Whether you are golfing, hiking, shopping or just relaxing, you will absolutely LOVE staying in our St. George Condos! 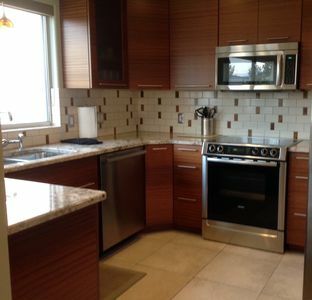 If your vacation needs require more than one unit, please visit listings 59864, 1005194, 1007083, 1007087. 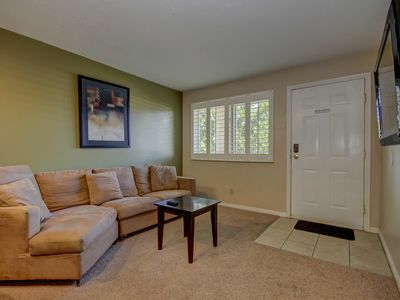 Our condos are all close in proximity, but comfortably far apart! 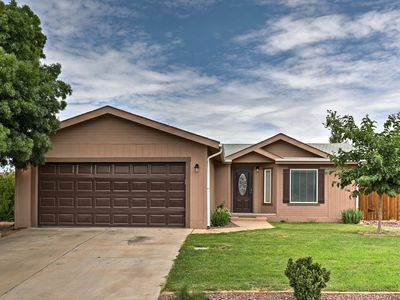 Including new paint, tile and carpet throughout, this condo has been recently remodeled. Enjoy the fresh, new feel it has to offer! 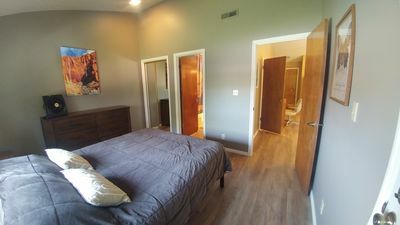 It features two bedrooms (with queen-sized beds) and 1 bathroom. 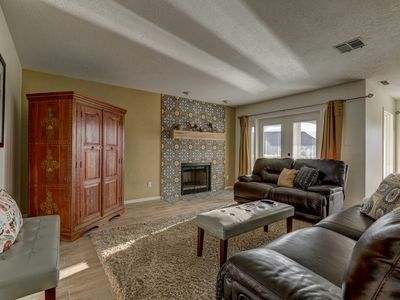 You will find a sofa sleeper in the great room that makes this condo perfectly comfortable for 6 guests. 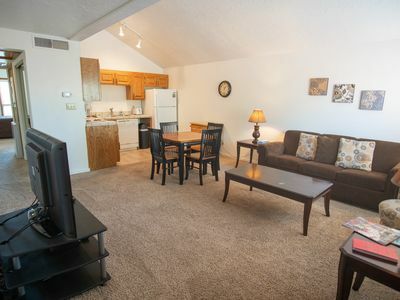 It has a beautiful 46' flat panel TV with cable, DVD, air-conditioning and covered parking. The washer and dryer, located inside the unit, is included in your rental (please remember to bring your own detergents). 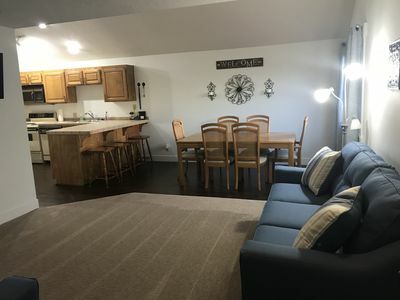 Linens are provided (bring your own pool towels) and there is a fully-equipped kitchen with microwave, dishwasher and refrigerator. 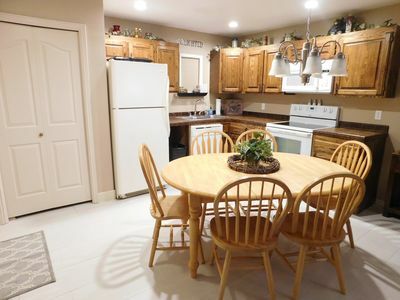 This unit has a walk-out patio, and YES, we offer free wifi. 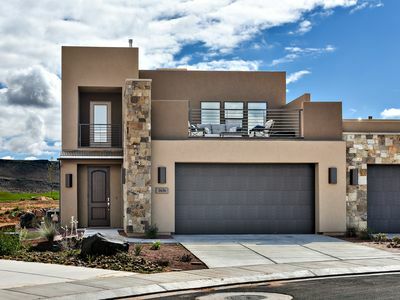 The St. George area boasts of many golf courses, Sunbrook being the closest to our units. You'll marvel at the breathtaking scenery that surrounds St. George, including Bryce Canyon, Zion's National Park and Snow Canyon. 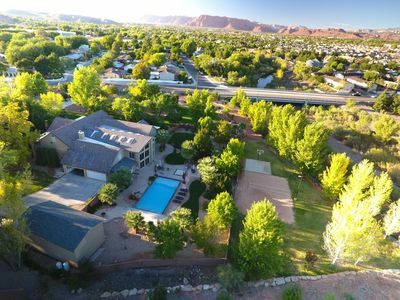 This 'Red Rock Corner' of Utah is dotted with historical sites, shopping malls and outlet stores, popular restaurant chains and, especially, the wonderfully warm Dixie Sunshine! 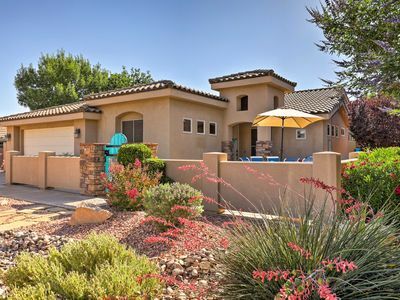 Same-day road trips might include hopping through the casinos in Las Vegas or Mesquite Nevada, sight-seeing at The Grand Canyon or attending Tuacahn's 'Broadway in the Desert' outdoor live amphitheater. We are also located right across the street from the world renowned Green Valley Spa. For those guests cooking up the perfect mountain biking get-a-way, we have all the right ingredients at our doorstep: Bear Claw Poppy, Zen, Stucci Springs and the Red Bluffs Competitive Area! There are also many opportunities to PLAY PICKLEBALL, both in the area and on-site! We've had some very pleased guests, and would like to make you - and all of your friends - one of them! We began renting condos 12 years ago with listing 59864, and that is where you will find our original guestbook filled with reviews. 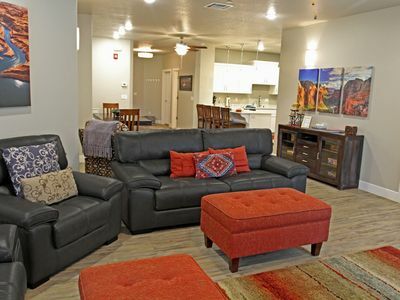 You will see that our comfy get-a-ways will truly become your home away from home! 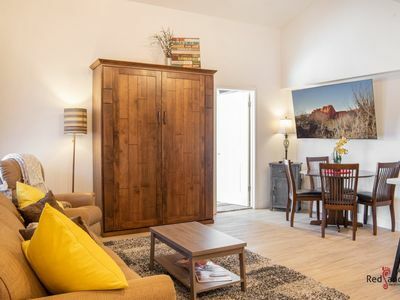 We'd like the opportunity to book your 'Suite Retreat' to Southern Utah. 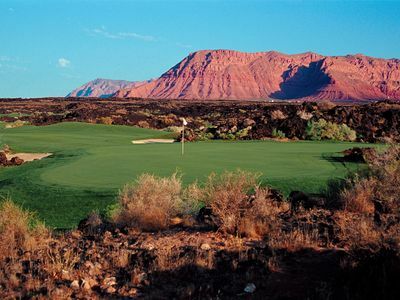 Snow Canyon Sunrise at The Ledges Golf Club *Resort Amenities Included! 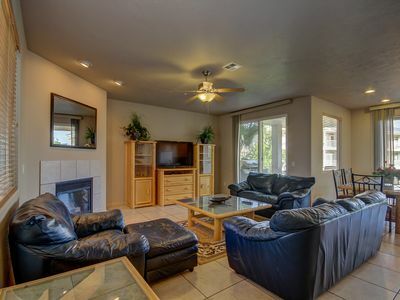 Remodeled 2 Bed 2 Bath Las Palmas Condo with access to Las Palmas Resort pools. 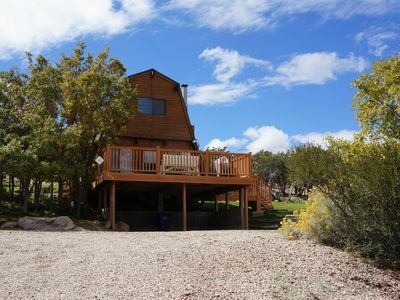 Home w/ Mountain Views - Near Zion National Park! 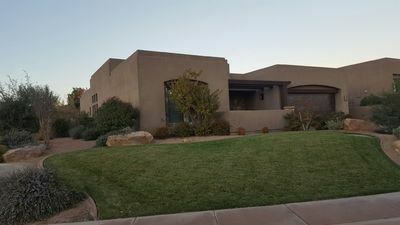 La Verkin House w/Patio - Mins to Zion Natl Park! 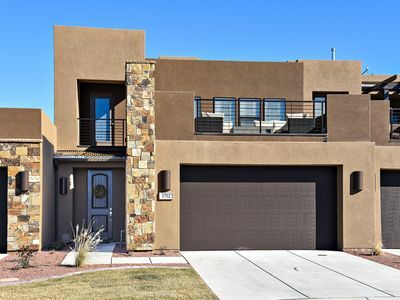 Quiet, peaceful area close to national parks and Las Vegas! 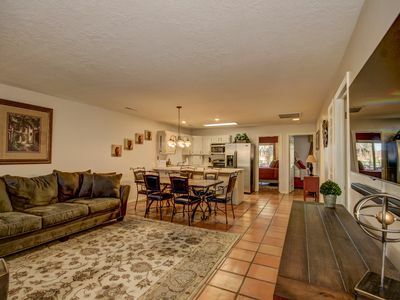 Remodeled Sports Village Condo quietly located on the top floor. D7 | HIGH-SPEED FIBER INTERNET, PS4, MODERN REMODEL, AND MORE!